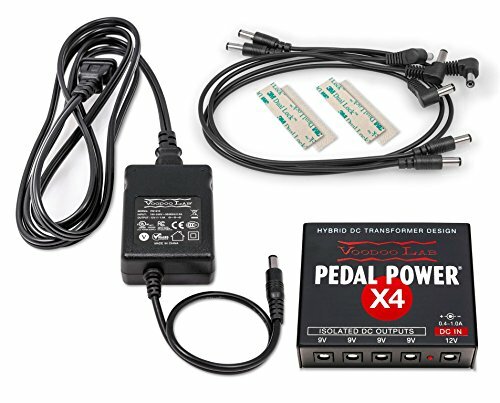 Pedal Power X4 is a professional isolated power supply for up to four battery operated or high current DSP effects. Housed in an ultra-compact aluminum chassis, the virtually weightless X4 easily mounts to even the smallest pedalboards. Pedal Power X4 delivers the pure and reliable power necessary for pedals to perform and sound their very best - all with zero added noise. Compact, lightweight, and energy efficient digital switching power supplies have become the norm for powering your laptop or charging your phone. Problem is, the same switching process that makes them compact and efficient also generates noise. Noise that no amount of filtering alone can fully mask. While acknowledging its many benefits, eliminating digital switching noise would be a pivotal benchmark to establish. Achieving this would require a complete revolution in design. As the pioneer and industry leader of low noise, isolated guitar effect power supplies, we began a 5-year research and engineering project. The result is a novel approach to power supply design, addressing the unique requirements of the guitar rig with noise effectively non-existent and zero audible artifacts under any circumstances. If you have any questions about this product by Voodoo Lab, contact us by completing and submitting the form below. If you are looking for a specif part number, please include it with your message.